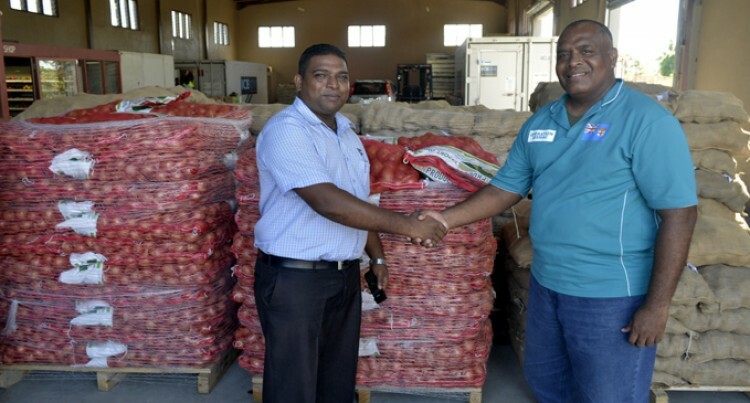 A New Zealand-based company operating out of Fiji yesterday handed over 10 tonnes of potatoes and onions to the Fijian Government. The donation from Turner & Growers (Fiji) Limited in Nadi was received by the Commissioner Western, Manasa Tagicakibau, on behalf of Government. “Our company has heart for those Fijians affected as well and there is a need to assist those in real need,” Nadi branch manager Abhilash Nand Swamy said. He said said the 40-foot container consignment was worth $18,000. The handover was held at their warehouse at Lot 5 Brewers Street, Martintar, Nadi. Mr Tagicakibau said: “Turners & Growers have done a great thing in the terms of assistance with fresh produce; potatoes and onion. He said his office had a fair idea of where they would distribute this to in terms of people most affected; mostly in the farming communities in the Ba area. He thanked the company for its assistance and briefed them on the work carried out by Government, non – governmental organisations, international donor agencies and the international community. Meanwhile, Mr Swamy said this was the gesture of their Fijian-born New Zealand-based director Bobby Sharma.